St. Louis last week. 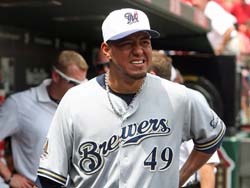 Yesterday in Chicago, Gallardo got his command back and pitched the Milwaukee Brewers to a 2-1 win over the Chicago Cubs at Wrigley Field. Gallardo allowed 5-hits in 7 innings of work, out-dueling Chicago’s Ryan Dempster in the win. Gallardo’s record is now even at 1-1. Reserve catcher George Kottaras followed Mat Gamel’s 7th inning double with a 2-run home run to give Gallardo all of the offense he would need. Francisco Rodriguez struck out the side in the 8th and John Axford did the same in the 9th, earning his second save in the last three days.